The 2017 Tax Cuts & Jobs Act (TCJA) added an employer tax credit for employers who offer qualifying paid leave under the federal Family and Medical Leave Act (FMLA). This includes small employers not otherwise covered under the FMLA. The credit is available for only two tax years — 2018 and 2019. If your company is interested in taking advantage of this employer tax credit, you should review and revise your leave policy to comply with the tax credit requirements. Your paid leave policy must be written and in place before you may take advantage of the tax credit for any leave offered under that policy. You may still take advantage of the tax credit for the 2018 tax year if the written policy is in place on or before December 31, 2018 (for calendar year plans) and you retroactively conform your leave practices to the requirements of the tax credit for the entire year. For tax year 2019, the written policy must be in place by December 31, 2018 (for calendar year plans). For example, let’s assume your taxable year is the calendar year, and an employee took two weeks of unpaid family and medical leave beginning January 15, 2018. You adopt a written policy that satisfies the law’s requirements on December 1, 2018 and choose to make the policy effective retroactive to January 1, 2018. At the time you adopt the policy, you pay the employee at the payment rate in in the policy for the two weeks of unpaid leave taken in January 2018. Assuming you met all other requirements for the credit, you may claim the credit for the family and medical leave paid to the employee for the leave taken in January 2018. Provide paid leave at not less than 50 percent of the wages normally paid to the employee. The government will cover 12.5 percent of the benefit’s costs if workers receive half of their regular earnings, rising incrementally up to 25 percent if workers receive their entire regular earnings. The credit does not, however, apply if paid leave is mandated by state or local law. Employees need to be allowed to take the leave for the same qualifying reasons as under the FMLA. If, however, you provide paid vacation leave, personal leave, or medical or sick leave (other than leave specifically for one or more of the purposes stated above), that paid leave is not considered family and medical leave. Not all employees are involved in the credit. If you’re claiming a credit for wages paid to an employee in 2018, the employee must not have earned more than $72,000 in 2017. 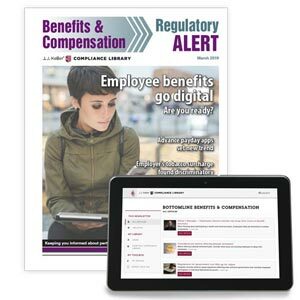 J. J. Keller's BottomLine Benefits & Compensation is an 8-page, monthly newsletter that addresses key issues relating to benefits and compensation programs.